Recently, I participated in a swap with another member on Ravelry. I really enjoy being a member of Ravelry and I have learned a lot there about crocheting. I'm a member of only one group, however; it's a group for fans of Lucy and her blog, Attic 24 and it's wonderful. I find that there's enough going on in that one group to keep me very busy and after nearly a year, I haven't felt the need to venture much past the group into the wider offerings of Ravelry. The swap was designed to celebrate "simple pleasures" in life, much the way Lucy does on her blog. We were given a small budget (about $16 US) and we filled out questionnaires about ourselves, then we were matched with a partner. My partner was Nicole, a woman who lives in Ontario, Canada. I think we were matched primarily because we both have a fondness for granny squares. Our swap packages had to include certain things: a handmade item, a skein of yarn, something we like that we wanted to share with our partner, along with other things we thought our partner would enjoy and a handwritten note. I had a lot of fun working on my package! I "stalked" my partner quite a bit around Ravelry, where she is a member of numerous groups. I think I created a good package for her. She seemed happy when she received it. My handmade item was a granny square scarf, made with Stylecraft Special DK. I made ten eight-round granny squares and slip-stitched them together to form a long chain, then I did one row of granny clusters all around the outer edge as a simple border. To prevent it from getting wavy, I used Bunny Mummy's tutorial for creating a flat border for granny squares. That's me above in the third photo, modeling the scarf. I was very happy with the way my scarf turned out and I think I'll make one for myself too! I do love making granny squares. I've gotten really fast with them lately. The scarf ended up being about five feet long and could be tied or wrapped a couple of times, so it was cozy and warm. I thought it would be good for those Canadian winters. I also included a skein of "snowflake" yarn from Hobby Lobby, from their Yarn Bee house brand. This is worsted-weight variegated yarn with little flecks built into the yarn to look like snowflakes for an interesting effect. I think it could be nice made into a hat. For the item I wanted to share, I sent Nicole some cut-out imitation-shell buttons. I love buttons. I have a fairly small collection but they are one item I always stop to look at whenever I visit a crafting shop. I found two cards of very pretty, intricately-cut buttons for her. Nicole said she was sort of a hippie at heart, so I thought she'd like some interesting soap with natural ingredients, which I picked up at my local World Market store. I also sent her a pumice stone for smoothing feet and a little embroidered, patchy bird decoration she can hang in her house; it has a pocket on the back which I tucked the button cards into. Nicole said she loved Jelly Belly jellybeans so those were included as well! After about two weeks, Nicole and I both received our packages on the same day! What a funny coincidence. I really expected the shipping time to be much faster between the US and Canada but we did have several large snowstorms here during that period which may have slowed the mail delivery. Nicole's package for me was worth the wait! She definitely took the time to get to know me via my blog and my Ravelry posts and projects. I loved everything she sent. My small Bears helped me open my package. They were pretty excited when I'd first torn off the outer wrapping; the box Nicole used was recycled from sausages and they thought we'd been sent sausages in the mail! What a lovely package she sent. She made that little crocheted owl pillow for me, isn't it adorable? I was tempted to let the GB keep it in her room, which has an owl theme, but I decided to be selfish and keep it in my room instead. It's sitting on my dresser. Nicole sent me two balls of Debbie Bliss Rialto Aran wool, which is just wonderful. It's the nicest yarn I've ever had. 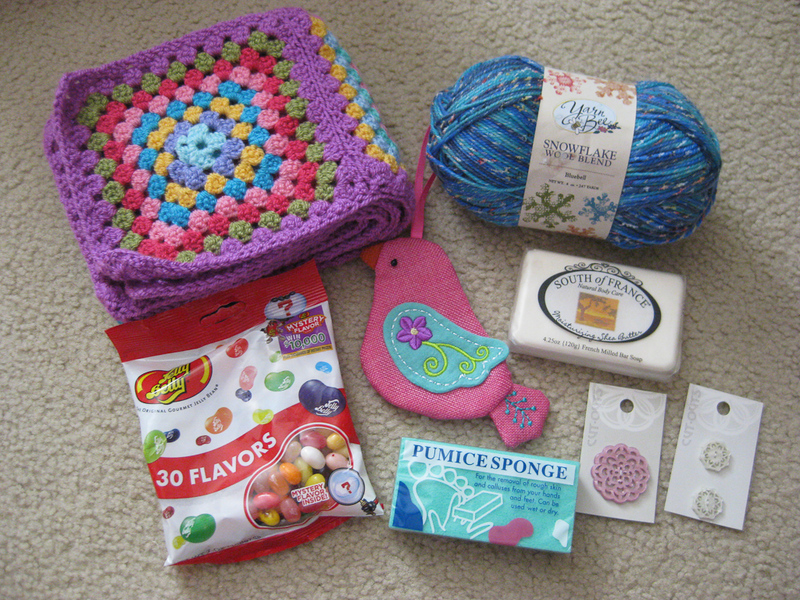 Three kinds of candy, a granny square how-to booklet, a package of cappuccino mix and an Anne Taintor magnet. The magnet was a really special surprise because I love Anne Taintor. I've been a fan of hers for years and the vintage style, and acerbic wit, are right up my alley. I actually already had an Anne Taintor magnet, given to me by the Bear's aunt, so I put them on the fridge together. For the record, I'm very nice to my children! Really, I swear. I do think these magnets are very funny, and I love the retro ladies and household settings on them. I really recommend poking around on Anne Taintor's website or Facebook page. I loved participating in a swap! This was the first time I'd ever done something like this. This particular swap was first discussed last summer and I checked every day for news about it and was finally rewarded after the holidays. I hope the group plans another before too long because I am pretty sure I will want to participate. Even though I don't know Nicole in "real life" I really enjoyed trying to learn about her online and as always, I loved making something by hand for a person who would appreciate it. That's a very rewarding thing. Thanks for a great swap, Nicole! Wow looks like you were really matched well with your partner. The scarf you made was beautiful. The color of the snowflake yarn was so pretty. The owl you received was really cute. It is nice when a swap works out well for both parties. That sounds like a very busy group you belong to on ravelry. Hi Softie! Thank you. I am very happy with how this went. The group is SO busy, I think there are around 7000 members at this point! Are you on Ravelry? What a lovely treat. I am so glad. I have enjoyed getting to know a little about you through your blog. Just lovely. I hope you continue to enjoy your crochet. I just love it too. Thank you for your very supportive comments about my little bit of Blogland over at Chalky's. I have just added you to my list of blogs I want to follow but i am not showing in your followers list.. I wonder why? Linda, did you try clicking the "follow this blog" button on my blog too? I think that will work if you haven't tried it and then you'll show in my list. Sorry, it says "join this site" and it's above the followers' icons. Thanks, Gillian! I really enjoyed myself. thanks again for the lovely parcel i always get nervous when i send a box..